Find the best Trapsatur trips. 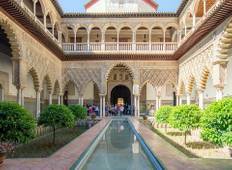 From Spain to Morocco, TourRadar offers 41 tours through 3 countries from Trapsatur. The tours span across 2 day to 19 day itinerary with prices ranging between $95 to $202 per day. "We really enjoyed the tour, the itinerary was good. The bus as well as all accommodation..."
"Ive already written a review about the guides. 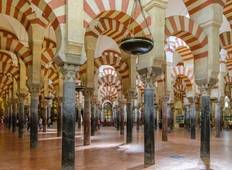 I enjoyed my itinerary of Andalusia..."
"Algo sale mal con el rating pues yo le doy 5 estrellas a pesar del tiempo que no..."
"I was travelling alone and I thought the itinerary was wonderful and had no issues..."
"The tour was very well organized and Riad was excellent. The breakfast were very..."
"The trip was fantastic a little lonely as it was just the 2 of us, but on the other..."
"Riad, in Portugal was excellent. Great personality, very well organized, schedules,..."
"Apart from the group being far too big, it was a good tour experience by Trapsatur." "We got little info before we left. 1st leg from Barcelona guide provided negligible..."